After phenomenal growth in 2nd half of last decade, Indian Telecom Industry had shown signs of slowing down in 2012-13. However, according to Voice&Data annual survey, Indian telecom industry seems to have got back on its growth path in FY 2013-14. The industry grew by a healthy rate of 10.8 percent thanks the robust growth witnessed in services space. 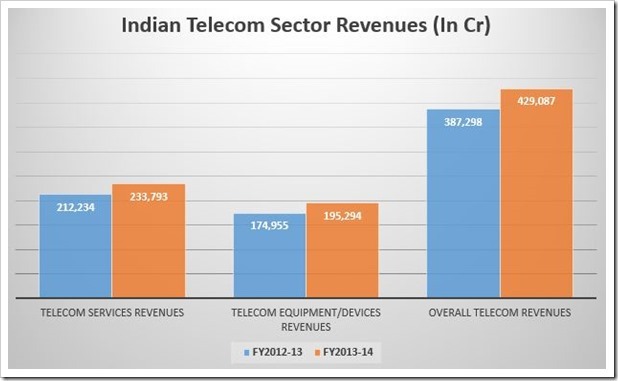 In FY2013-14, Indian telecom Industry registered total revenues of Rs. 429,087 crore are compared to Rs 387,298 crore in the previous financial year. The telecom services sector which comprises of enterprise services as well as voice, data and value added services recorded cumulative revenues of Rs. 233.793 crore contributing 54 percent of total revenues. The hardware, telecom equipment & solutions market contributed Rs. 195.295 crore (46 percent of total revenues.) The services sector grew by 10.1 percent, while the equipment side grew at slightly higher at 11.6 percent. The top 3 telecom services companies were Airtel, Vodafone and Idea respectively who contributed to over half the overall revenue. Among all the service providers, Uninor registered maximum growth of 21 percent year on year. Even in our monthly telecom subscriber growth coverage we have seen that Uninor has been doing exceedingly well in adding new subscribers. In 2014, they have added more subscribers compared to even larger operators like Reliance and Tata Docomo. On the telecom hardware and equipment side, Samsung, Nokia and Indus towers were the top vendors and contributed close to 30 percent of the revenues in FY 2013-14. Among all the equipment vendors, Micromax registered a phenomenal growth of over 115 percent in revenues. In our view, 2014-15 may witness even more accelerated growth, thanks to the impeding launch of 4G services by Reliance Jio Infocomm and other vendors who got spectrum licensees earlier this year. The telecom operators have invested heavily into infrastructure and equipment to offer these 4G data services and that will clearly reflect in revenues generated in FY 2014-15. Newegg Now Starts Delivering Products To India!